Kylie Rivers brushed a lock of her curly brown hair out of her eyes and peered at the horse books. "Kylie! Time to go!" Her Mum called. She sighed and followed her mum out of the bookstore. Kylie's mum handed her a shiny silver coin. "Go make a wish." She waved her hand at a big fountain. Excitement fizzed through Kylie. What should she wish for? Then the answer dawned on her. A horse! She quickly made her wish and hurried back to her Mum. In the car ride home, she daydreamed about horses. In her room, Kylie drew a horse picture and then hung it up, and went downstairs for dinner. Her Mum and Dad were already eating. When they were done, her dad said, "I have a surprise for you buckaroo. You're getting a horse and riding lessons!" Kylie screamed, and jumped around, and hugged her Mum and Dad. "Come on outside and see your new horse." Her dad opened up the trailer and out stepped a blanket Appaloosa. "What are you going to name her honey?" "Princess. Her name's Princess." Kylie replied. She put on a pink halter and then they walked off into the sunset. Kylie Rivers reached up and wiped the sweat from her forehead. She smiled at her horse Princess. The two of them had just finished a riding lesson. Just then she heard a car honk. "That's mom. Gotta go!" Kylie hopped in the car and buckled her seat belt. "Hey Kylie," her mom said. The two of them chatted about Kylie's riding lessons, her mom's promotion at work and other things. Kylie threw herself on her bed and sighed happily. Life was good. "I'll get it mom!" Kylie yelled and raced down the hall. 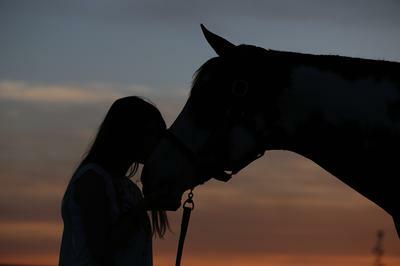 She glanced at the caller ID: Ivyleaf Equestrian Center. That meant it was Jane, her riding instructor. "Hello," she said. "Uh-huh... wait, you what?!" "I entered you in a riding competition, that's all." Jane said. "It's only 2 classes, a simple walk and trot class and Best Turned Out. Now, if you excuse me, I have a class to teach." Over spaghetti, Kylie told her mom everything. "So she didn't ask you?" Kylie's mom asked. "Just try your best." Her mom said and began to clear the dishes. Beautiful writing, keep up the good work! Interesting story! Can't wait to read about her horse lessons! It's a beautiful story. Style of writing is very good. Keep it up & please write more. I love your writing style. Keep it up. Continue to write, I want to know the rest of the story.